May i suggest, for history lovers, this word for 2019: Perspective. You may have heard me say that we cannot, and should not, judge the past by present standards. This word says it all. Happy New Year! While my usual topic of conversation is history, today I would like to look forward, instead of backward. In honour Of Earth Day, I would love to encourage you to do whatever you can to protect the future of our planet, in whatever way you are called. You may be the go-to neighbor for organising local clean-up events. Perhaps you ensure that your household is fastidious about recycling. You may be that coworker who is a terrific example to others, with your BPA-free reusable water bottle. Or maybe you have a passion for educating others on keeping our oceans clean for marine life! As far as the past, English history is especially close to my heart (as you know!). My affinity for the Tudors is no secret. I also adore reading about anything that falls under “medieval,” Marie Antoinette, and the general history of the British monarchy. When I set my sights on the future of our earth, my special love is protecting pollinators. And to narrow that down even more, I’m wild about raising native (solitary) bees. They are gentle (no stinging! ), extremely effective pollinators, easy to raise, and – let’s be honest – they are absolutely adorable. See that pic above? That’s one of my sweet little leafcutter bees from last summer, practically smiling for the camera! I’m currently working with my mason bees, lovely little cuties that will fly in mild spring temperatures to pollinate the fruit trees that pop up this time of year. For more information on keeping these hard-working and darling critters, check out the website of Crown Bees. I get most of my materials from them and they have loads of good info. Whatever you do to love and preserve our earth, keep doing it. Do it with fervor and with the generosity to encourage others. Many of us thrive on learning about our past, but we cannot ignore our future. “Learning cursive (joined-up writing or handwriting in the UK) is on the decline in the States, due to the implentation of the Common Core Standards in most states, as well as the erroneous belief that cursive writing is useless and antiquated in the modern world. 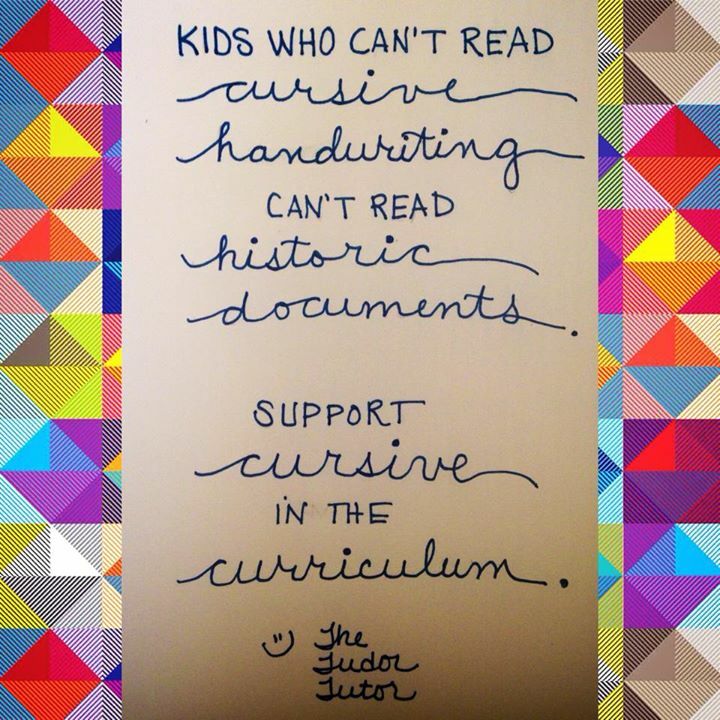 On the contrary: Research has shown that cursive writing improves brain development, hones fine motor skills, sharpens categorisation skills, and teaches the brain to integrate visual and tactile information. I mean both! This holds for historic documents such as the Declaration of Independence, and also for historical documents. For example, last weekend our family visited Culpeper, Virginia, which holds quite a bit of US Civil War era history. In the town’s museum, our 12-year-old daughter was able to read a 19th-century letter from a soldier to one of his relatives, describing the conditions in the area and events happening at the time. That’s why I mentioned not being able to read communication from people who do write in cursive, not to mention the many other educational benefits listed in the original caption (above). To restate the first paragraph of the original caption, “”Learning cursive (joined-up writing or handwriting in the UK) is on the decline in the States, due to the implentation of the Common Core Standards in most states, as well as the erroneous belief that cursive writing is useless and antiquated in the modern world.” While cursive writing may have been pushed aside in some places before Common Core came about (and yes, CC does not mention cursive at all: that’s precisely why it’s not considered a part of the CC curriculum), at least eight CC states to date have made cursive mandatory in schools, including California, Massachusetts, and North Carolina. Oh my goodness, enough of this. The flow between my w and r may render the distinction fuzzy. However, rest assured that I know how to spell it and that the w is the letter that’s there. * While, as an educator, I much prefer manipulatives to digital educational enhancements, I don’t mind sharing these apps which can add to a child’s learning of cursive writing: Cursive Writing Wizard by L’escapadou, Intro to Cursive by Montessorium, Cursive Writing by Horizon Business Inc, and Zaner-Bloser Handwriting by Zaner-Bloser Inc.
* To see wonderful examples of Tudor signatures, please see this board on my Pinterest page.